Nicol Ann David is definitely one of the most successful sports woman in Malaysia. We have witnessed how Nicol David surprised everyone by winning various junior and senior tournaments at a very young age. She's also known as our squash queen and Malaysia's future hope after winning multiple sports awards for her achievements. 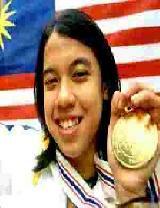 This website is specially created to acknowledge Nicol David for all her success in making Malaysian proud. A new WinAmp skin has been added to the download section. This Nicol David WinAmp skin is created by Ice. Also I have sent a few invitation to celebrities for them to contribute in the Star Wall section. Let just hope they will respond. Welcome to the all new "Nicol David Fan Site". After a 6 months break, this fan site is now back online with new design, better contents and hopefully more visitors. Check out the new site! Nicol David is now ranked 21 in WISPA latest ranking. She has moved a few spots up after 2 tournaments in Las Vegas and San Francisco. For more news , click here!